Instagram might be in for some nasty weather. Despite having over 400 million monthly active users, recent data shows user interaction within the community has slowed down dramatically. A new report, conducted by social media analytics firm Quintly, shows the number of likes and comments on Instagram posts has dropped substantially. According to the numbers, which were gathered from over 13,000 Instagram accounts, the number of likes and comments plummeted 33 percent year-over-year across the board. What’s interesting about the numbers is that the spread of the drop in interactions is rather unbalanced. Instagram users with 1 to 1,000 followers saw almost no change in content interaction during this time, while superstar users with over ten million followers saw a 50-percent decrease in interactions when averaged for both still and video posts. Below is a visual breakdown of the numbers. No need to worry that Instagram is getting near the end of its lifespan though. 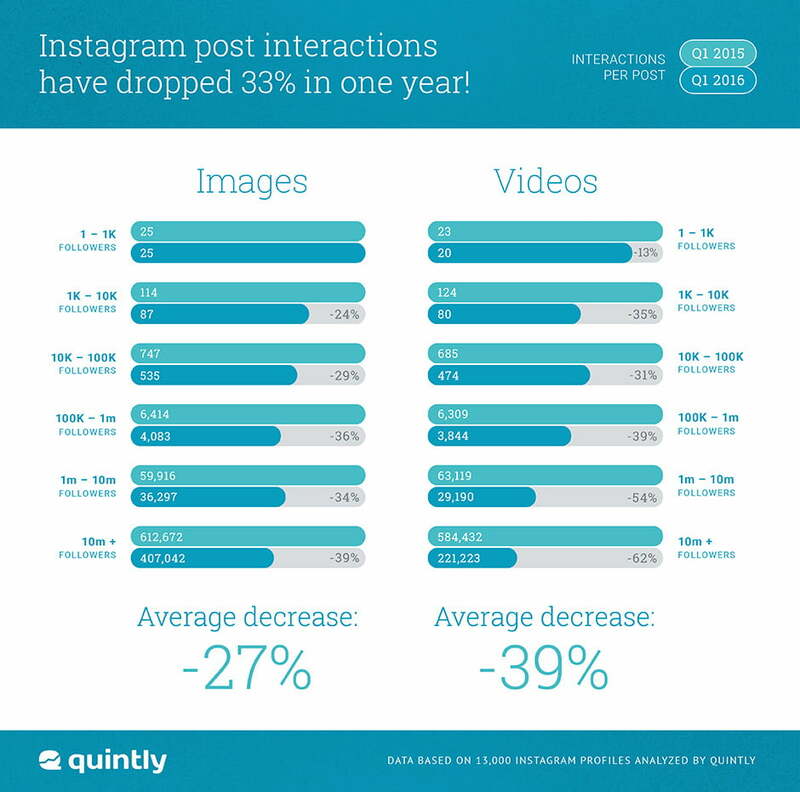 According to Quintly, this decrease in interactions is merely the result of Instagram’s ever-increasing user base. As Instagram becomes more populated, more posts are being made. With more posts being shared, users are facing more competition to get their content appreciated. Despite this decrease, Quintly says interactions on Instagram are still higher than what is occurring on both Facebook and Twitter. And if you’re wondering how to ensure your posts continue to get recognized, Gottke says the key is to “be as authentic as possible” and make your content seem personal.